It happens – you are super excited to have your braces off that you forget (consciously or otherwise) to wear your retainer as often as you should. This may seem inconsequential, but not wearing your retainer can have serious implications on your orthodontics, as it allows your teeth to move back to their original places; you know, the places you did not want them to be in the first place. Dental implants are a proven way to replace missing teeth and rehabilitate a severely handicapped jaw. 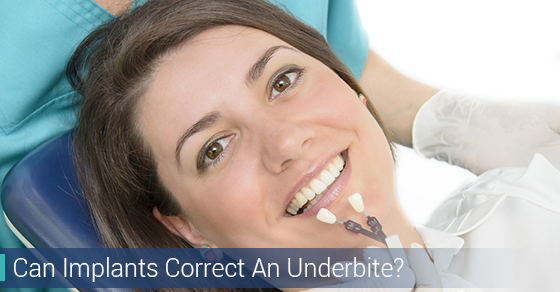 Unfortunately, they may not be your answer to correct an underbite, as this condition occurs when lower teeth overlap the upper teeth. If you have experienced a relapse after having orthodontics, tooth extraction and dental implants may not be the best solution. Additional orthodontics can work better to move your teeth back to their desired position. Removing healthy teeth can possibly cause other unnecessary problems, which is why orthodontics are less invasive way to correct a relapse. Invisalign braces may be a good option to correct your smile. Invisalign braces utilize removable clear medical grade plastic appliances that are nearly invisible. With Invisalign braces we can correct many issues with the misalignment of teeth, as well as some underbites. This state of the art technology enables many adult patients to accomplish orthodontic treatment without conventional braces. If you are unsure as to how Invisalign braces will work on your smile, you will love our state of the art digital photography and imaging systems. Excellence is not achieved by chance, but consistently from a systematic approach including diagnosis, communication, treatment planning, execution and case maintenance. By previewing your new smile digitally in our clinic, we can help facilitate your treatment decision. In adult patients, severe underbite correction might require orthognathic jaw surgery, a process in which a surgeon separates the bone in the rear part of the jaw from the front part and repositions the jaw carrying the lower teeth further. This surgery is extremely invasive and only performed in necessary cases. If appropriate for the patient, Invisalign braces are the optimal choice for correcting bite and smile. Every mouth is different, so the most efficient way to determine which route to take is to schedule a consultation at a clinic. Contact us for more information about Invisalign braces or any of our other services and to set up a consultation appointment.